For this deals roundup, we have listed down the best deals Flipkart has on laptops from brands like Dell, HP, Lenovo and more. If you’re tired of working on your old slow machine and looking for a decent upgrade, then we’ve got you covered. 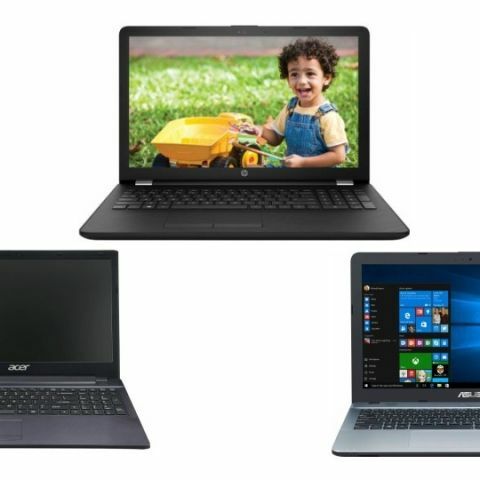 We have picked out the best laptops that are available on Flipkart with a pretty good discount. The platform is also offering an additional 5% cash back on select bank debit & credit cards. The Acer Aspire 3 comes with a 15.6-inch HD display, which offers a resolution of 1366 x 768 pixels. The machine is powered by an Intel Core i3 7th Gen processor, which is paired with a 4GB DDR3 RAM and 1TB hard drive. As far as the graphics card is concerned, it has an Intel HD 620 graphics card equipped in it. The laptop comes with pre-installed Windows 10 as well, which means one does not need to worry about installing an OS separately. Click here to buy. The Asus F541UA laptop sports a 15.6-inch HD anti-glare display with a resolution of 1366 x 768 pixels. The laptop is backed by an Intel Core i3 6th Gen processor, which is paired with a 4GB DDR4 RAM and 1TB hard drive. The system has an Intel HD 520 graphics card installed in it. Buyers will also Windows 10 pre-installed with this system. Click here to buy. The Lenovo Ideapad 320 offers a HD resolution and an anti-glare display, which offers a resolution of 1366 x 768 pixels. The laptop is powered by an Intel Core i3 6th Gen processor, which is paired with a 4GB DDR4 RAM and 1TB hard drive. The laptop comes with DOS, which means one need to install an OS on their own. Click here to buy. The HP 15q sports a 15.6-inch HD display that comes with a resolution of 1366 x 768 pixels. The laptop is powered by an Intel Core i3 7th Gen processor, which is paired with a 4GB DDR4 RAM and 1TB hard drive. The laptop has one HDMI port and two USB ports for connecting external devices like a flash drive or portable hard disk. Buyers need to install Windows on their own as the system is not installed with any OS. Click here to buy. The Dell Inspiron 14 3467 features a 14-inch display, which offers a resolution of 1366 x 768 pixels. The laptop is powered by an Intel Core i3 6th Gen processor. The device packs a 4GB DDR4 RAM and 1TB hard drive. The laptop comes with pre-installed Windows 10 as well. Click here to buy.